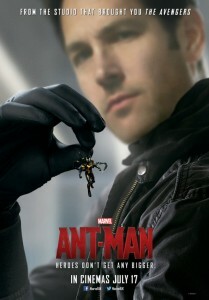 Comedy star Paul Rudd (Our Idiot Brother, Wanderlust) embraces the role of Ant-Man, the latest superhero to join the Marvel Universe. 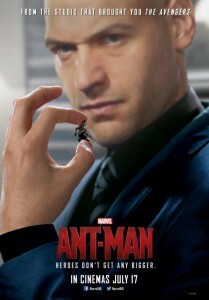 In this case size does matter and Ant-Man’s unique ability to shrink to the size of an ant and evade capture while destroying intricate servers is something to marvel at. 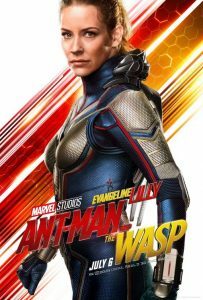 Director Peyton Reed’s Ant-Man is humorous, hilarious and filled with spectacular moments which will find the audience rooting for the diminutive superhero who is desperate to join the Avengers team. 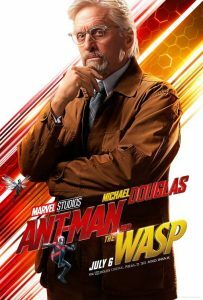 Oscar winner Michael Douglas (Wall Street) plays quantum physicist Dr Hank Pym has developed a unique formula which can reduce a man to the size of an ant and cause damage along with his army of assistant ants. For once this is a superhero who is without any angst, but just an average guy who happens to be a convicted felon desperate to see his daughter again. 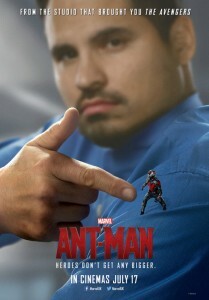 Scott Lang, wonderfully played to perfection by Paul Rudd, and for once the casting could not have been better is a down and out cat burglar and at the request of his dumb friends, led by the dim-witted Luis hilariously played by Michael Pena breaks into the San Francisco home of Dr Pym to steal jewels and cash. 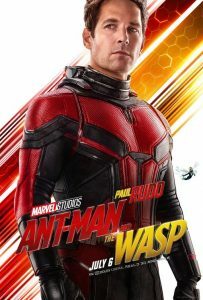 Instead, Lang steals an Ant-Man suit and unwittingly shrinks and realizes that this nifty ensemble enables him to escape from most situations, including jail, where he is arrested by his daughter’s stepfather Detective Paxton played by the ubiquitous Bobby Cannavale. 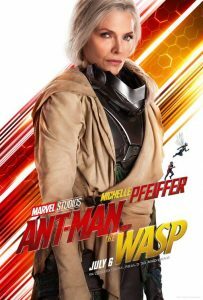 Soon Lang is rescued by Dr Pym and his gorgeous daughter Hope van Dyne played by Evangeline Lilly (The Hobbit: Desolation of Smaug) who train Lang to be the elusive Ant-Man. The evil villain is the megalomaniac scientist Dr Darren Cross, played by Corey Stoll who is keen on developing his own shrinking suit and selling the sought after formula to the sinister Hydra which is out to destroy SHIELD, of whom the Avengers are a part of. The fact that the final battle between Cross and Ant-Man takes place on top of a Thomas the Tank engine toy in Lang’s daughter’s bedroom is emblematic of who the target audience is. 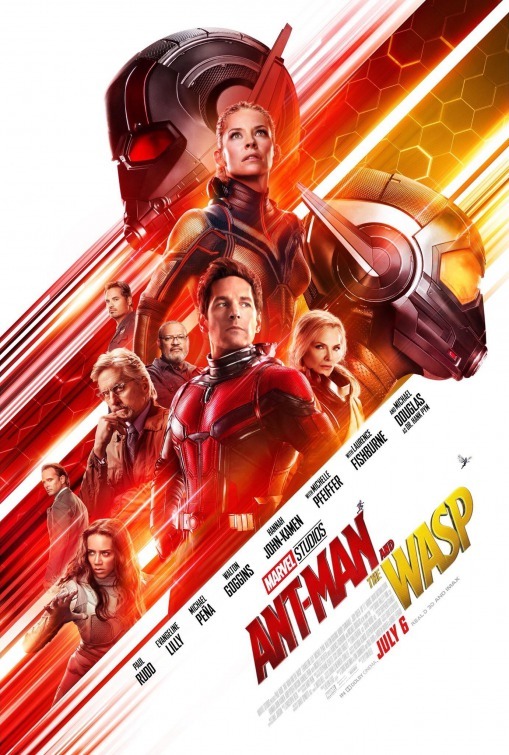 Nevertheless Ant-Man is visually spectacular, comical and often hilarious and a much better film than anticipated. 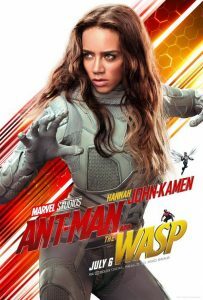 This is a superhero movie which does not take the entire genre too seriously, but has huge ambitions to join The Avengers. Fans should watch out for cameo appearances by Anthony Mackie as Falcon and Hayley Atwell as Agent Carter. Ant-Man may not match up to the likes of Captain America or Iron Man but could certainly prove that size does count and in this case being smaller is infinitely better. 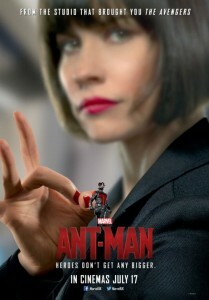 The 3-D visual effects are amazing and Rudd keeps the entire film light and quirky. 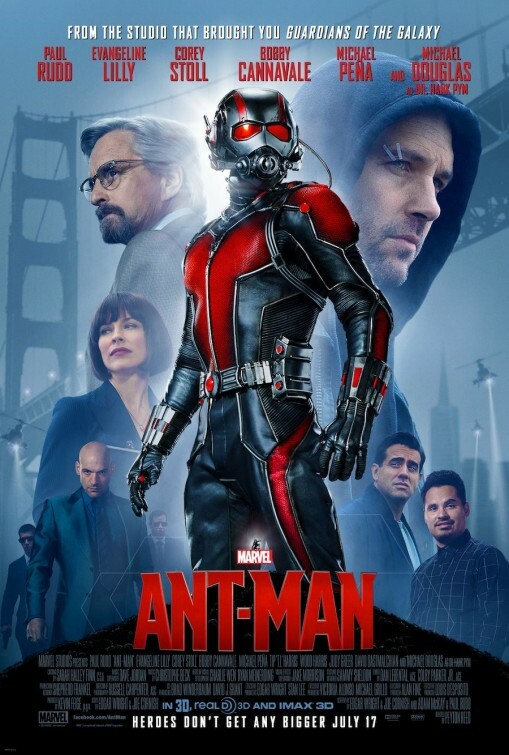 Ant-Man is recommended viewing for those that enjoyed The Avengers and Guardians of the Galaxy. There is a confession to be made. I am not a huge Melissa McCarthy fan having missed most of her films which have made her famous including Bridesmaids, The Heat and Tammy. So it was with a mixture of trepidation and curiosity that I went to see director Paul Feig’s comedy thriller Spy mainly because I am a huge Jude Law fan. So I thought it would be interesting to see whether such a diverse cast such as Melissa McCarthy, Oscar Nominee Jude Law (The Talented Mr Ripley, Sherlock Holmes), action star Jason Statham (The Expendibles 3, Transporter Trilogy), Bobby Cannavale (Blue Jasmine, Danny Collins) and Rose Byrne (Annie, Marie Antoinette) could elevate such a film as Spy. Despite its exotic locations from Varna in Bulgaria, to Paris, Rome and Budapest, Spy is a second rate thriller which attempts with some hilarious if not crude consequences attempts to feminize the espionage genre, and more specifically rip off the ultimate Spy films, The James Bond Franchise. The 007 franchise have nothing to worry about as Spy is so second rate and middle of the road, even the predictable narrative could not have threatened the Bond films as a serious competitor. Let’s face it. 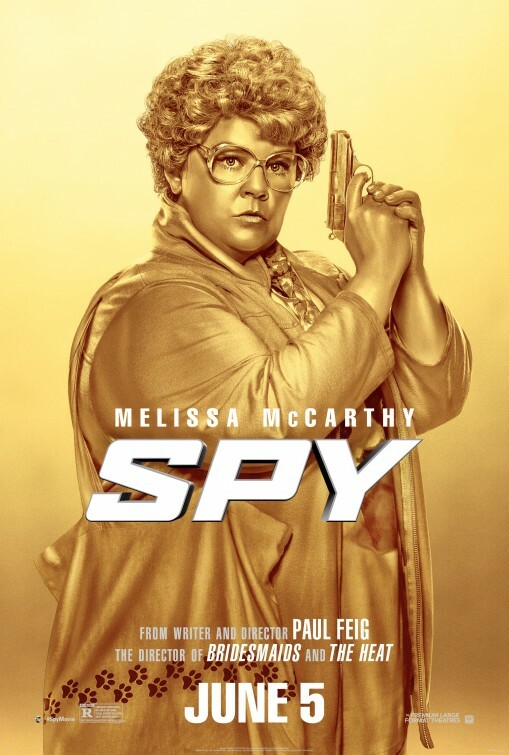 Spy is really a comedy especially with the likes of Melissa McCarthy, British comedian Miranda Hart and Bridesmaids co-star Rose Byrne thrown in. But Jude Law? Seriously after making appearances in such exceptional films as The Talented Mr Ripley, Hugo, Sherlock Holmes and Anna Karenina, I wondered what he was doing in such a ridiculous film. Crazy, Stupid, Love director Dan Fogelman creates a more bittersweet comedy with Oscar winner Al Pacino (A Scent of a Woman) in the lead as the irascible and flamboyant ageing rock star Danny Collins in a film of the same name. Featuring a great supporting cast including Oscar winner Christopher Plummer (Beginners) as Danny’s manager Frank Grubman and Annette Bening (Being Julia, Bugsy) as Mary Ann Sinclair, Danny Collins is by no means a superb film, but a character driven story about how one man starts to take responsibility for the fame and the recklessness of his life as he enters his semi-retirement years. 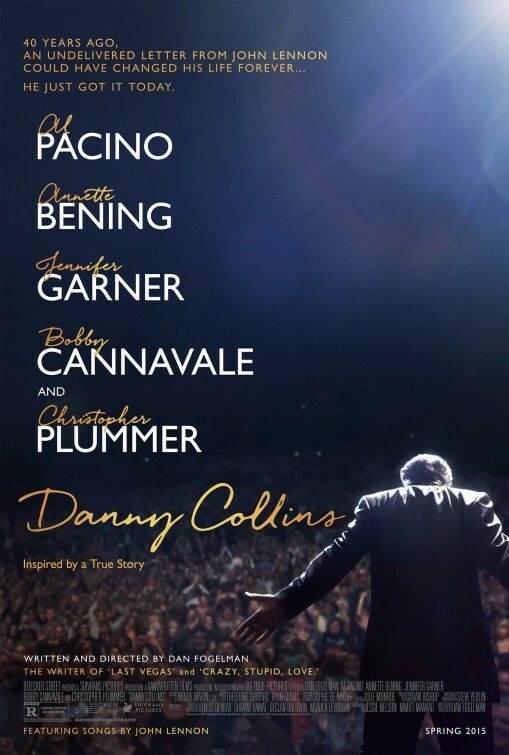 Plummer’s charcter acts as a sort of conscious for Danny Collins, who at a ripe old age is still snorting cocaine and drinking too much, attempting to marry woman half his age, while his musical career flat lines as he basically just pelts out the same songs that made him famous in the early 1970’s. As Danny Collins says “I haven’t written an original song in thirty years”. This is preceded by a wonderful scene in Los Angeles outside the legendary Hollywood hotel Chateau Marmont where Danny stops his Mercedes sports car and stares at a Billboard above Capitol Records of his latest album – Danny Collins, the Greatest Hits volume 3. So where do ageing rock stars go to retire and reconnect with their estranged children? New Jersey of course! In suburban New Jersey Danny checks into the Wood Lake Hilton run by the amiable yet strict divorcee Mary Ann, wonderfully played against type by Bening. Written by Fogelman too, he saves the best dialogue for Pacino and Bening and its these scenes mainly in the hotel bar that work the most in Danny Collins. Soon the story takes a twist when Danny Collins tries to reconnect with his grown son Tom, played by Bobby Cannavale, who is perfectly cast as Pacino’s son, although personally I would have liked to see them in a gangster film together. Cannavale shot to fame after winning a Prime-Time Emmy Award for his role as the violent gangster Gyp Rosetti in the excellent HBO series Boardwalk Empire and since then has been cast in numerous films including Woody Allen’s Blue Jasmine, Jon Favreau’s Chef and most recently the remake of Annie. Once again Fogelman saves the best dialogue for the bitter-sweet bonding scenes between estranged son and rock star father. Jennifer Garner (Dallas Buyers Club) has a minor supporting role as Tom’s sensible and pregnant wife Samantha Donnelly. At times Danny Collins felt unevenly written and at times the dialogue worked beautifully, but the film would never have been successful without the charisma of Al Pacino in the lead role. Yet despite all this talent, Danny Collins is a minor yet amiable film about characters reconnecting and rockstars coming back down to earth with a bang. More of the plot could have been embellished but one got the sense that Fogelman had run out of ideas by the time the script had run its course. Nevertheless Danny Collins is recommended viewing but could be saved for DVD and for those that enjoyed Last Vegas. Naturally the iconic Pacino (Scarface, The Godfather, Heat and Carlito’s Way) is fantastic but one gets the sense that even such an accomplished actor needs more to work with to make a film credible. The 21st century film version of the hit Broadway musical Annie is no match for the 1982 cinematic treatment of the musical by director John Huston. In the 2014 version, director Will Gluck has chosen to rather focus too much on making it a contemporary New York tale and less of a classy musical. Although that does not distract from the onscreen sparkle of the lead actress Quvenzhané Wallis, who embraces the role and become famous for being one of the youngest performers to ever be nominated for an Oscar for Beasts of the Southern Wild. The updated version of Daddy Warbucks, is a cellphone billionaire Will Stacks, wonderfully and almost gleefully played by Oscar winner Jamie Foxx who embellishes the role with humour and charisma. The supporting cast is equally good including the rising actor Bobby Cannavale as Stack’s scheming publicity driven press officer Guy and his real life wife Rose Byrne who is brilliant as Grace. The casting of the film was diverse and brilliantly done with the exception of Cameron Diaz as Miss Hannigan, whose performance was jarring and questionably overplayed. Audiences should expect all the wonderful songs of the Broadway musical with a more edgy tunes thrown in along with every available social media innovation that has beset American urban life in the last ten years including Facebook, Twitter and Instagram woven into an increasingly frenetic social narrative. 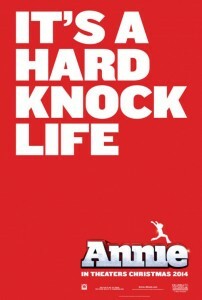 This Annie is no down and out orphan in Depression era America, but a rising vivacious star in a 21st century post-recession America, emphasizing that the gap between the rich and the poor has widened considerably in the last eighty years. Excluding any social commentary, the 2014 Annie is a great feel good film and director Gluck makes fill use of the Big Apple as his primary location especially the spectacular scenes at the Guggenheim Museum, the Brooklyn Bridge and stunning aerial shots of the New York skyline. If audiences are expecting a polished and flawless musical such as Into The Woods, then Annie is not for them. 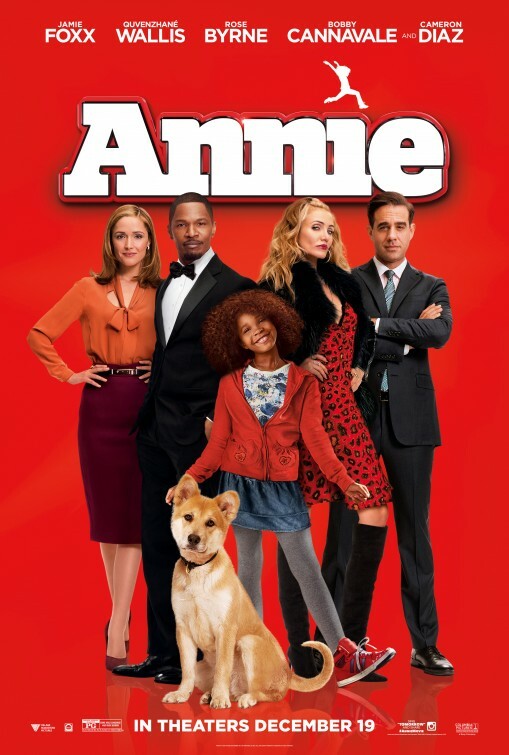 Will Gluck’s Annie is a much thinner, at times disjointed and very light hearted version which comes off slightly messier as the rags to riches storyline gets updated from its original 1930’s period setting to appeal to a the millennial generation. Whilst the effort can be applauded and the production design including Stacks’s smart internet connected New York penthouse is a must-see, this Annie remains a tamer version of the 1982 classic film. Definitely suitable for children and those that want to avoid a hard knock life! 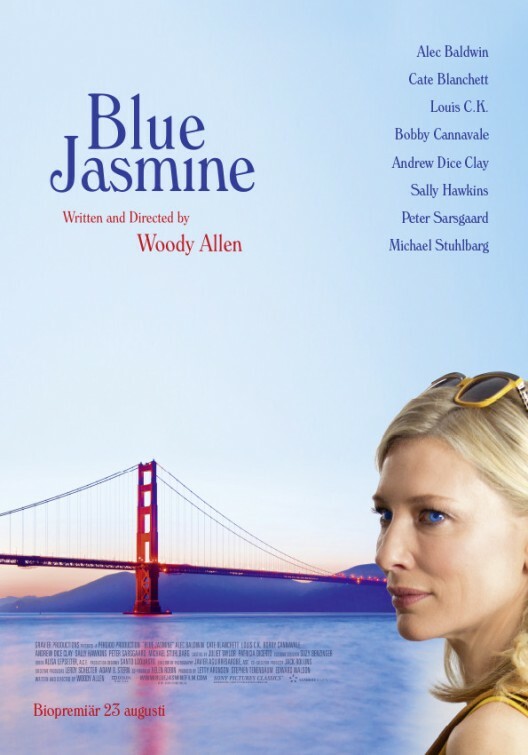 Oscar winner Cate Blanchett (The Aviator) gives a tour-de-force performance as the lead character in Woody Allen’s brilliant new American drama Blue Jasmine. Audiences get introduced to Jasmine French a blue-eyed blond hair designer clad Park Avenue socialite as she flies first class to San Francisco to stay with her sister Ginger. Jasmine is all Xanax-popping, Vodka drinking glamour but underneath all the loquaciousness is a woman who has clearly unravelled from a series of financial and social setbacks. Director Allen gradually peals back the layers of Jasmine through a series of flashbacks to her former life in Manhattan and New York where she shared a sumptuous marriage with her shady hedge fund manager cheating husband Hal played by Alec Baldwin and an event which has caused Jasmine to lose everything from her social status to her mind as she clearly flees the East Coast to seek refuge with her non-biological sister Ginger wonderfully played by British actress Sally Hawkins (Happy Go Lucky, Great Expectations) in Northern California. The contrast between Jasmine and Ginger soon becomes apparent in their diverse taste of men amongst other things. Where Jasmine is clearly drawn to the smooth talking affluent alpha males who will shower her with gifts so as long as she does not need to care about anything embodied by the slimy Hal (Alec Baldwin), Ginger on a far reduced significant living standard is clearly drawn to the more working class, emotional men from her ex husband Augie played by Andrew Dice Clay and to her new more passionate boyfriend a car mechanic named Chili in a superb performance by Bobby Cannavale (from Boardwalk Empire fame). Jasmine that has lost everything financially while still retaining her designer wardrobe and always attempts to look glamorous as she clearly delusional realizes that her life has irrevocably changed forever. Soon she is forced to take a job as a receptionist in a dentist surgery in San Francisco with an amorous dentist played by Michael Stuhlbarg (A Serious Man) while attempting to improve her computer literacy skills. Her down to earth impoverished sister Ginger carries an affair with Chili as she works in a suburban grocery store. Director Woody Allen shows a very incisive portrayal of two women, one constantly on the verge of a nervous breakdown while the other is happy to pursue an elusive yet sustainable dream of survival and happiness. Blue Jasmine clearly belongs to Cate Blanchett as she is almost in every scene of the film and this is a new collaboration between Allen and Blanchett which has proved to be quite masterful, a legendary film director who has rediscovered a more sophisticated and brilliant muse who tackles the flawed but vulnerable Jasmine. After the recent success of Woody Allen’s European films, mainly Vicky Cristina Barcelona, Midnight in Paris and Matchpoint, the famous and hugely talented director turns back to his first love Manhattan, but viewed through an angle of San Francisco, an oblique and poignant point of view that is almost showing signs of a farewell. What makes Blue Jasmine so masterful is Blanchett’s wonderfully poignant portrayal of the unravelling of a socialite, a performance that is Oscar worthy to say the least, not to mention absolutely riveting. Blue Jasmine is Woody Allen at his best directing one of the most talented actresses of the 21st century, Cate Blanchett, who I was fortunate to see years ago in a London West End production of David Hare’s play Plenty. A highly recommended film, Blue Jasmine is sure to garner both Blanchett and Hawkins much praise and attention at the imminent 2014 awards season.